Starwood Preferred Guest (SPG) has extended its Paradise Got Closer 35% off award promotion until March 8, 2016. 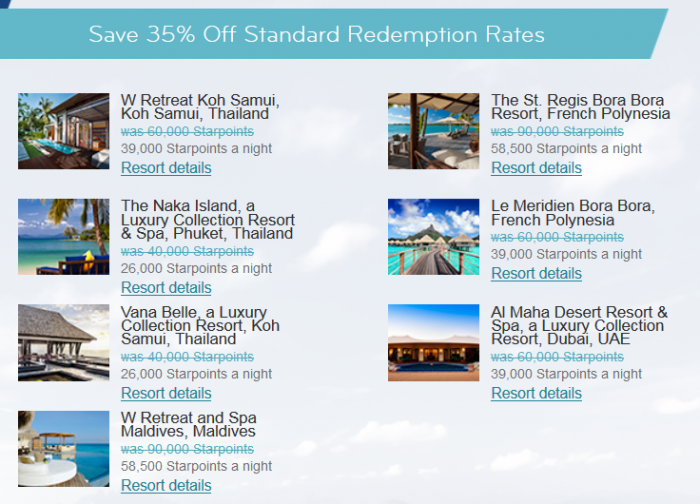 You can save 35% off of awards at seven ridiculously priced (using Starpoints) hotels that don’t have “standard” accommodations available. Note that you can still get fifth night free even when using this award type and save more on longer stays. These awards are not available online, but you have to call SPG to book them and remind about the discount. These are one of the most expensive and usually overpriced awards that you can find from SPG due to the “non-standard accommodations” clause that results jacking up the Starpoints rate to the skies. I could consider redeeming for the W in Maldives or perhaps Le Meridien or St Regis in Bora Bora at these rates, however.